WBGO is the world's number one voice for jazz, blues, classic soul, and R&B. Our Jazz Leadership Society (JLS) is a group of major donors who are united in the spirit of celebrating this music's rich history, while exploring its ever evolving present and guaranteeing its bright future. If you believe that WBGO is a vital cultural institution worth your philanthropic support, then please join this special community that contributes to WBGO in a significant way, to keep this great music alive. Contact John Newcott, Director of Individual Giving at (973) 643-4302 / jnewcott@wbgo.org for information. You receive exclusive access to unique experiences that will take you inside the making of this great music you so generously support. You will also become part of a vibrant community of special contributors who help develop and grow the value of the programming and services WBGO provides, which includes our award-winning news coverage and community outreach programs. Our core development team will provide a personalized concierge service throughout the year that will include complimentary ticket offers (for you and a guest), to: concerts; club performances; film screenings and other cultural events. You will be guaranteed attendance at one of the four events in the WBGO/Yamaha Salon Concert Series in NYC, hosted by Michael Bourne and recorded for broadcast. Opportunity to record a personal testimonial in the WBGO studios for use during an on-air Membership Drive. You will receive a recording of your testimonial as a keepsake. Recognition of your generosity on a dedicated acknowledgement page on the WBGO website and in the lobby of WBGO's studios. Through our concierge service, we will help make arrangements for you to receive a complimentary pair of tickets to a show at the Blue Note Jazz Club* or Dizzy's Club Coca-Cola* during the course of the year. You receive exclusive access to unique experiences that will take you inside the making of this music you love. You will also become part of a vibrant community of special contributors who help develop and grow the value of the programming and services WBGO provides, which includes our award-winning news coverage and community outreach programs. A special invitation for you and a guest to attend one of our Monday Nights with WBGO at Dizzy's Club Coca-Cola* in New York City, a monthly series hosted by Rhonda Hamilton. You'll be seated at the WBGO table with Rhonda and a member of the core Development team of WBGO. It's a unique chance to enjoy a premier jazz performance at one of the finest clubs in NYC. Availability is limited. A personal invitation for you and a guest to come to the WBGO Studios for a live broadcast and have the opportunity to meet the artist and our interviewing on-air announcer. Our core Development team will appraise you of dates, times, artists and availability. 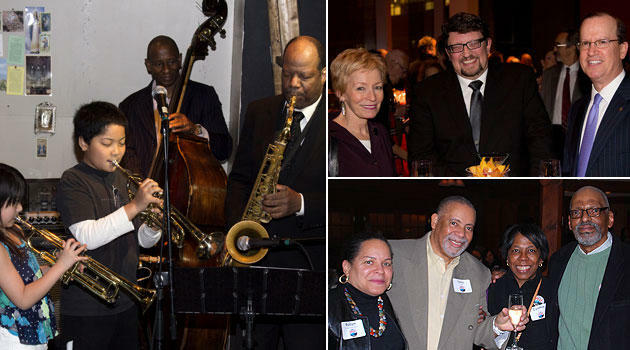 The Champions Circle consists of a unique group of Major Donors to WBGO, who through their extra generous financial support, make a significant impact in maintaining the excellence of our programming, while keeping the vision and mission of the organization vibrant and relevant. It provides unique opportunities for direct involvement and engagement in the process of moving WBGO forward, including interactions with WBGO's Board of Trustees and key staff. In addition to all of your JLS benefits, as a Champion you receive VIP access to, and interaction with, the producers and presenters of this great music and the rich stories they have to tell about all that informs it. This includes exclusive private events available only to the Champions Circle. A private invitation for you and a guest to lunch or dinner with WBGO President/CEO Amy Niles and your favorite WBGO Host (pending their availability). At this meal, you'll have an opportunity to engage in a discussion with your WBGO host of choice about your favorite music, which will result in them creating a special playlist exclusively for you. These Jazz Leadership Society annual benefits are for 2018 and are subject to change. * Complimentary tickets cover admittance only.